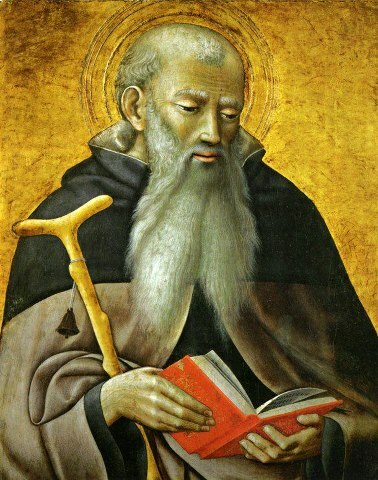 Saint Anthony the Great is known as the Father of monasticism, and the long ascetical sermon in The Life of St Anthony by St Athanasius, could be called the first monastic Rule. When St Anthony was about twenty years old, he lost his parents, but he was responsible for the care of his younger sister. Going to church about six months later, the youth reflected on how the faithful,in the Acts of the Apostles, sold their possessions and gave the proceeds for the needy. Then he entered the church and heard the Gospel passage where Christ speaks to the rich young man: “If you would be perfect, go, sell what you possess and give it to the poor, and you will have treasure in heaven; and come follow Me." Anthony felt that these words applied to him. Therefore, he sold the property that he received after the death of his parents, then distributed the money to the poor, and left his sister in the care of pious virgins in a convent. Leaving his parent's home, St Anthony began his ascetical life in a hut not far from his village. By working with his hands, he was able to earn his livelihood and also alms for the poor. Sometimes, the holy youth also visited other ascetics living in the area, and from each he sought direction and benefit. He turned to one particular ascetic for guidance in the spiritual life. In this period of his life St Anthony endured terrible temptations from the devil. But the saint extinguished that fire by meditating on Christ, thereby overcoming the devil. Realizing that the devil would undoubtedly attack him in another manner, St Anthony prayed and intensified his efforts. Anthony prayed that the Lord would show him the path of salvation. And he was granted a vision. St Anthony tried to accustom himself to a stricter way of life. But the devil would not cease his tricks, and trying to scare the monk, he appeared under the guise of monstrous phantoms. The saint however protected himself with the Life-Creating Cross. Finally the Enemy appeared to him in the guise of a frightful looking black child, and hypocritically declaring himself beaten, he thought he could tempt the saint into vanity and pride. The saint, however, vanquished the Enemy with prayer. In the year 544 the relics of St Anthony the Great were transferred to Alexandria, and after the conquest of Egypt by the Saracens in the seventh century, they were transferred to Constantinople. The holy relics were transferred from Constantinople in the tenth-eleventh centuries to a diocese outside Vienna. In the fifteenth century they were brought to Arles (in France), to the church of St Julian.